I’ve been a lazy blogger, but please go check out my guest post today on Herbivore Triathlete! So what have I been up to??? Running (8 miles Tuesday and 8 miles Thursday), reading through the 200 posts waiting for me on Bloglovin’ and chasing Cooper out of places he shouldn’t be, like the dishwasher! PRE RACE: So I probably stayed up 1 hour too late and had about 1/2 glass of wine too many, but here I am, it’s 5am and I need to be awake. I lost the BOY to last night’s festivities with my brother and dismissed him from early morning triathlon duty knowing that my parents would meet me at the course. The race location is about 20 minutes north, and I was impressed with how smoothly transition set up went. On the way to the race sight, I realized that I forgot my bike gloves. I was able to catch my parents before they left, and my Mom was happy to lend me a pair. She arrived just as transition was closing, but they let me run in to add my gloves. To wet suit or not to wet suit?! That was the pre race question. I had multiple opinions from my family, and others were discussing it in transition. In the end, I decided not to go with the wet suit. I began to doubt my decision (along with all of my ability to swim) as I walked down towards the beach where participants were ‘warming up’ in the water and starting to line up by waves. I kept myself busy chatting with my parents and some other racers, and then strolled over to the beach for the race start. Man, that looks like a LONG 1/3 mile swim, I thought as adrenaline started pumping through my veins. I think this photo sums it up perfectly! Go! I start swimming and immediately forget all of my pool practice. Not being able to see through the murky water, I find myself picking up my head often and using the breast stroke right away. Wait a minute…I can do this! I can swim! I start to find my rhythm and then pop my head back up. Stay calm, I tell myself. The goal is to swim this efficiently and not waste precious energy by panicking. 1/3 of the way down and I’m rounding the corner hoping not to get run over by the younger girls trailing at my feet. Rounding the next Buoy and the end is in sight. With less swimmers near by, I find my swim stroke groove (better late than never) and head towards the beach. Shoot, I realize, I forgot to start my watch. OMG! I didn’t wish my dad a happy father’s day! TRANSITION 1 (4:02): I emerge from the water and start my watch. I see my Mom waiting for me and cheering me up the hill. I continue my run remembering to wish my dad a happy father’s day before entering transition. Transition??? It’s been a year since I’ve done this…where to start…swim cap and goggles off, feet dry, socks clean, bike shoes on, fix hair, helmet on, sunglasses, check, gloves, thanks mom! A sip of water and my bike and I are on our way. 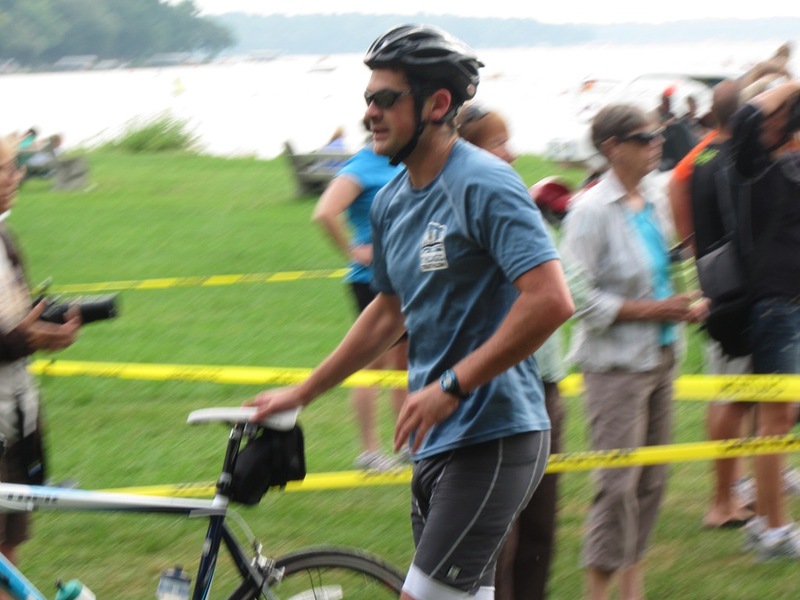 BIKE (14 miles 47:47): Oh no…did I just miss the timing pad?! Who knows, but not much I can do now that I am on my bike and speeding away. What a gorgeous day for a bike ride! I hope this isn’t a hilly ride! I quickly settled into my bike and started shifting gears from muscle memory. I felt light on my bike and started passing other racers. I felt energetic throughout the entire bike ride, moving quickly down the little hills and using momentum to power up the inclines. I chatted and cheered on bikers that I passed, and only got passed by 2-3 other racers. About 45 minutes into the race, I ate 1/2 a Larabar while reminding myself to drink water throughout the bike (even though I kind of needed to pee). Swift and steady, I continued riding my ‘biking high’ deciding instead of riding today, I was going to race. The bike has never been a strength of mine, but I knew that this would be one of my fastest races. I ended up with a 17.6 mph average. If I bonked on the run, then I bonked on the run, but I was interested to see how far I could push myself. TRANSITON 2 (1:46): To pee or not to pee? This was the new question. Biking gear off and running shoes on. Plus a tshirt and a race belt. Then, I was running out the other end of transition past the potties and around the lake. RUN (3.1 miles 23:45): Today’s goal…8 minute miles for a 24 minute run. My legs felt heavy, but I was happy to have completed a handful of BRICK workouts during my training. The run started off sunny, but I found some shade as I rounded the far side of the lake. Mile 1…under 8 minutes. Sweet! Just keep putting one foot in front of the other. Mile 2…7:51. Almost done! I focused on keeping my pace reminding myself that I didn’t need to go any faster or any slower. I past a few other racers and one shouted out to me ‘When you finish, come back and pick me up,’ which made me smile. I spotted my mom with a little over a 1/4 mile to go. She started shouting and cheering me on as I kicked it into a sprint. I later saw video of this self-described sprint and it really was more like a run : ) My parents said that my bright orange tshirt was easy to spot and they were able to find the best locations on the course to encourage me and document the day with photos and video. I rounded the last corner and pushed towards the finish line. My run ended up being the 9th fastest out 39 in my age group. Woo Hoo! POST RACE: I immediately received my medal, a freezing cold sponge, and took 2 bottles of water. My parents were waiting to congratulate me on my race! While I’d been working hard, my Mom had made friends with multiple people including the Athleta sales girl who she was eager to introduce me to. I was feeling great, not sore at all, and proud of my strong race. I was happy to walk around the post race expo before finally making it to the bathroom. I couldn’t stop raving about how well organized this race was and had the opportunity to tell one of the Iron Girl employees how much fun I had (and beg her to come back to Lake Zurich again next year). Because of the location and awesome venue, this is a race I would do again next year for sure! I was a huge fan of the Iron Girl race series! If you are looking for your next race, I would definitely check out their website! Everything from packet pick up to transition was organized perfectly! There is a table of hand sanitizer, sunscreen, chapstick, and other necessary beauty products by the port-a-potties. The race course was filled with inspirational messages. Who doesn’t love an event dedicated to girl power? 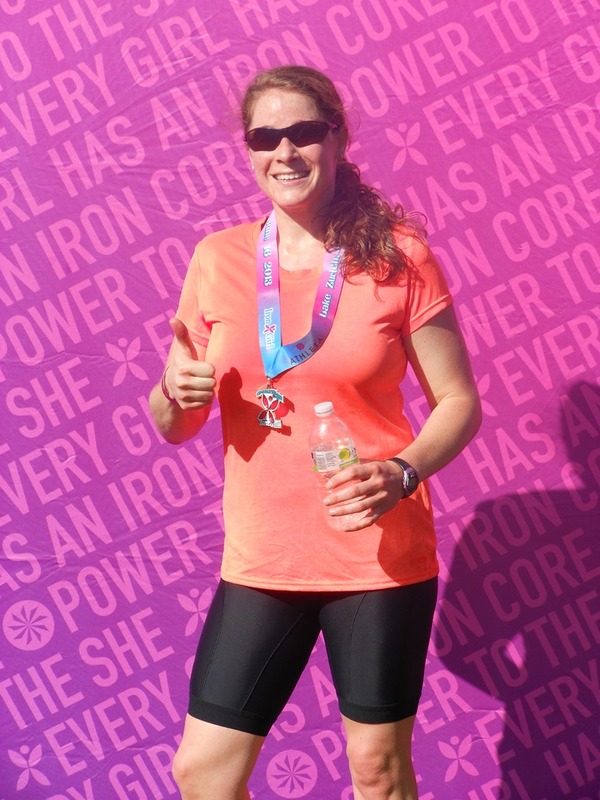 Have you ever done an Iron Girl event? What was the best race you’ve ever done? Our alarm went off at 6:30am, and the BOY and I snoozed twice before actually walking up! We were able to get ourselves pulled together and out of the door on the way to the Heartland 5k for K9’s. A friend of mine was doing her first 5k, and I was tagging along or moral support. 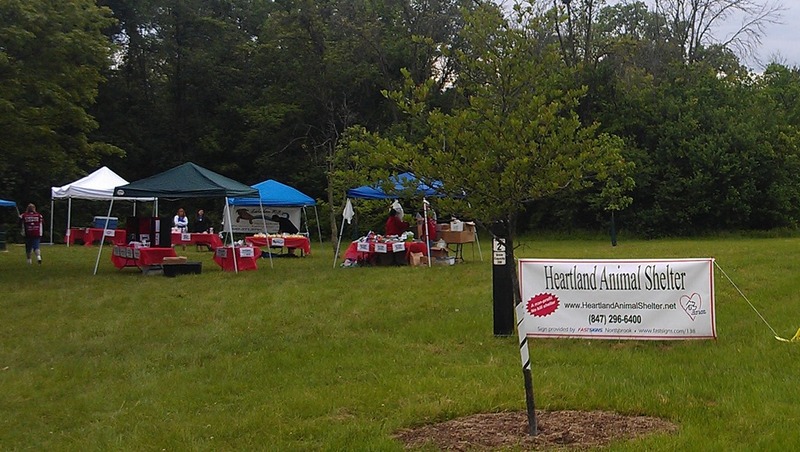 This run/walk was a tiny, well supported event to race money for a local animal shelter. I was super proud of my friend who ran the entire 3.1 miles and even had enough push to sprint to the finish! After the race, the BOY and I swung by Starbucks for a warm beverage and a change of clothes for me before our biyearly trip to the dentist, where I hoped they wouldn’t find chia seeds stuck in my teeth after this morning’s race. The office was busy and seemed to be running late, so we were there for way longer than expected. After the dentist, the BOY and I planned to swing into Naf Naf for lunch. I’m telling you if you’ve never been to Naf Naf and live in (or are visiting) Chicago, you should definitely check it out. They make their pita fresh, and it is by far the fluffiest, and most tasty pita around! I’m only slightly embarrassed to say that I devoured my sandwich and some hummus in a short time : ) The BOY and I came back home after lunch, where I spent about 15 minutes replacing the battery in bike commuter. When I finally got it figured out, it still didn’t work. The BOY loaded my bike onto his car and we drove up to Lake Zurich for packet pick up and bike drop off for tomorrow’s triathlon. I was hoping and was correct that there would be a local bike shop at the expo. The guy was super nice, got my biked all tuned up, and showed me how to move my receptor on the wheel to get my computer working again. I know that I will be happy to have it tomorrow as I pace my way through the 14 mile ride. I placed my bike in transition and picked up my race chip (with this soft and comfy ankle band). This is my first Iron Girl event, and I have been looking forward to it for months. Of course, seeing the lake got the butterflies bouncing about my stomach, but that is just par for the course with me. All of the volunteers at check in and transition were helpful and friendly. I got an adorable shirt AND a huge jar of Biscoff Spread amongst my other goodies in my SWAG bag. When we finally made our way home, the BOY went down for a nap (it was a lot of action for him for one day), and I started to pull together my shoes, equipment, and clothes for tomorrow’s race. I also threw a crumb cake into the oven (a box mix that I picked up at TJ’s this morning in between Starbucks and the dentist). By 5:00, I finally got around to taking a shower before the second half of our day began. My brother and his fiancé just walked in the door for dinner and the Hawks game. The BOY will be grilling up some sea bass and potatoes for dinner, and I stocked the fridge with wine to celebrate their engagement. I changed into my new race Tshirt for inspiration before tomorrow’s race and to remind myself not to stay up too late…ha ha! Am I allowed to complain some more about the weather??? It was another grey and dreary weekend around here. Total Bummer! I woke up Saturday morning extra early for a bike ride. I had a busy day starting with a baby shower and then three of my girlfriends were coming over for a sleepover. My road bike is back in business and, and I desperately needed to take it for a spin. It’s been a long time since I’ve been clipped into this bike, so I was not as comfortable as I pedaled out to the path. I had big plans to head up north to ride along the winding, hilly roads, but with the sun hiding behind dark clouds and a strong wind blowing, I thought it might be safer to stay closer to home. After my ride, I quickly showered and changed for the baby shower. It was about 50 minutes away, but the skies were clearer when I arrived. Unfortunately, I had to leave early to get back home in preparation for our evening. Three of my close girlfriend’s were coming over for a husband and baby-free sleepover (we kicked the BOY out for the night, but luckily his parents live close). First up was mani’s and pedi’s…followed by a little shopping. Then a Fiesta Dinner at our house complete with Two-Ingredient Crockpot Chicken, homemade guacamole (that one of my friend’s made), Sorority Spinach Dip (we were sorority sisters, what can I say? ), chips, salsa, and more! We ate until we were full, catching up in between bites, and then retreated to the couch to relax. It didn’t take long for big laughs to follow remembering old stories from college and looking through old photos. For dessert, we picked at Peanut Butter Bars (my friend’s secret recipe) and Nutella Puppy Chow (recipe to come). My friends are truly incredible! They are beautiful, loyal, honest, and energetic. They balance full time jobs with husbands and kids, maintaining a wonderful sense of humor along the way. In the 14 years since we all met as freshmen in college, we don’t get to see each other as often as when we were living a few floors away. 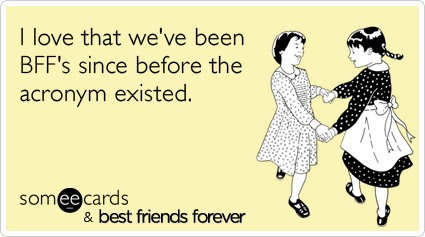 Yet, we are always able to pick up exactly where we left off…our friendships growing with each year and each new adventure. Spending Saturday evening with ‘just the girls’ was priceless! We didn’t stay up too late, and the three of them were wide awake early this morning. I made some tea and we munched on fruit and Chocolate Chip Pound Cake in our PJ’s while watching the food network. My friend’s grandma used to make the most delicious chocolate chip pound cake that we would chow down on in college stuffing our faces with our fingers. The best part was the doughy under-baked middle. 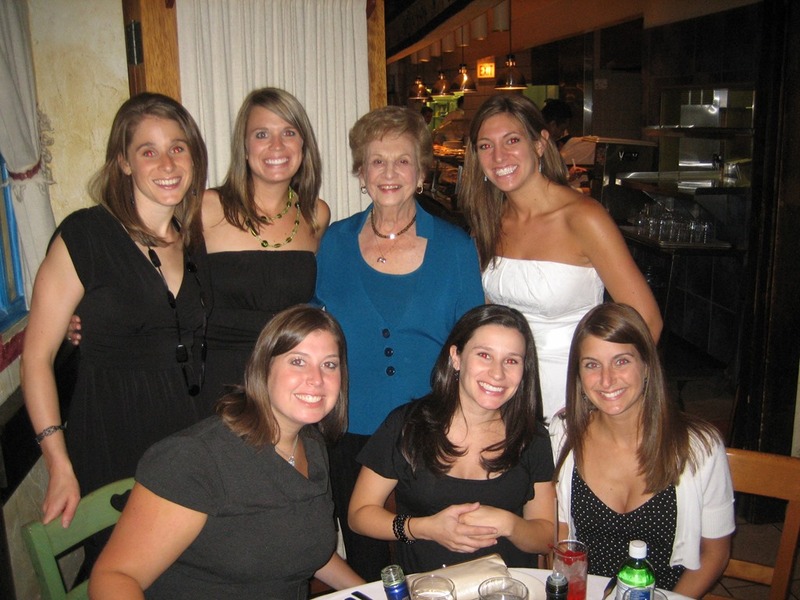 Since college, I have been trying to get my hands on this recipe, but it is a family secret. In honor of those days, I wanted to make us pound cake, but knew that I had some time restraints, so I cheated using a cake mix recipe. It was tasty (and even a little doughy in the middle), but nearly as good as grandma’s. After breakfast, the day was spent exploring the shopping mall. When I walked back out to the parking lot, it was misting and gross…perfect for a quiet Sunday in. I drove back home to reconnect with the BOY who was happy to be back home in his Lazy Boy chair. After a memorable Saturday night, I am already looking forward to our next girls get together! Spending time with my besties was exactly what I needed after a crazy busy work week to put a smile on my face and keep life in perspective. You girls are the BEST! If someone had asked college Jen to do a triathlon, she probably would have laughed in your face or called you ridiculous…most likely both. Although I have always been a runner, I hadn’t owned a bike since elementary school and my swimming skills consisted of sitting on a float at the indoor lazy river on Sundays with my hungover friends. TRUE STORY! If you read my running history, then you have some idea of how college Jen grew into a half marathoner and eventually a triathlete over the last 10 years. I’ve completed 4 sprints and 1 Olympic distance triathlon since falling in love the sport in 2010. Truth be told, my initial motivation was…well, if my younger brother can do, so can I. And last year, I beat him in a race (sorry kid!). The idea for this post came to me during Monday’s BRICK workout. 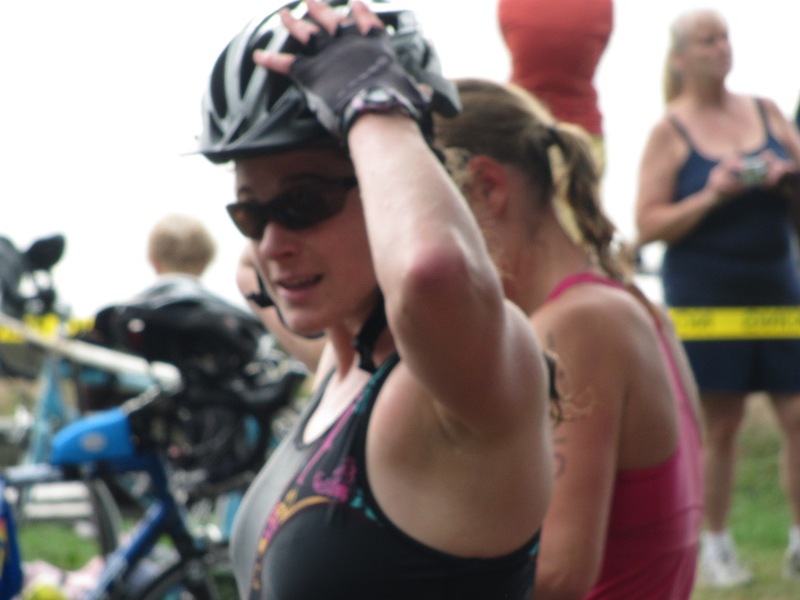 With my first triathlon of the season rapidly approaching (less than 4 weeks away…yikes! ), I was excited to get back into my training schedule. As I was riding, I started thinking about what makes a BRICK workout so exciting and why it is I keep sign up for these demanding races. If you can swim, bike, then run with a smile on your face, then can’t you take on anything? This means eating right to fuel long workouts, getting plenty of rest, and dealing with stress. Anyone who runs knows that it is as much of a mental challenge as it is physical. Rising to that challenge is an indescribable feeling! I love meeting other athletes, especially during local races. 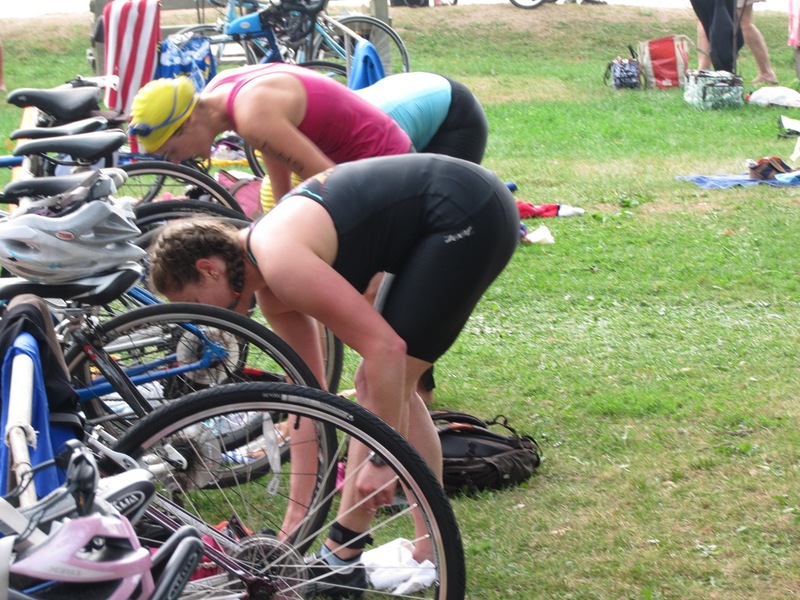 Before my first triathlon, I went swimming in Lake Michigan to face my fear of open water. After 15 minutes of wrestling into my wet suit, I was beyond intimidated before even sticking a toe in the water. The nicest man (and fellow triathlete) talked me through it, gave me tips, and gently encouraged me. That was the day that I learned that finishing just one race makes you part of a supportive community. People are amazed to discover my triathlon hobby. I think because they don’t realize that anyone can complete a sprint triathlon, you just have to train. Before I knew anything about tri’s, I was always interested in what motivated someone to try this race and what the training looked like. There’s always a lot to talk about in regards to equipment, workouts, and chaffing stories. Each day is a different combination of running, cycling, and swimming. For me, this prevents burn out because if I don’t want to swim, I can grab my bike and head outdoors and if I’m not in the mood to run, I know where to find the pool. Cross training (along with yoga) keeps my muscles balanced and prevents overuse injuries. I’ve never been very crafty and don’t collect coins or stamps. It’s good to have something non work related that interests and challenges you. It’s even better if it supports a healthy lifestyle! My brother and mom have both done tri’s and my dad is the best photographer out there. The BOY is the first one to put my bike on the car in the morning and has the strength to take it off after the race when I am heading straight for the shower. There’s always someone to celebrate with me after a nap. 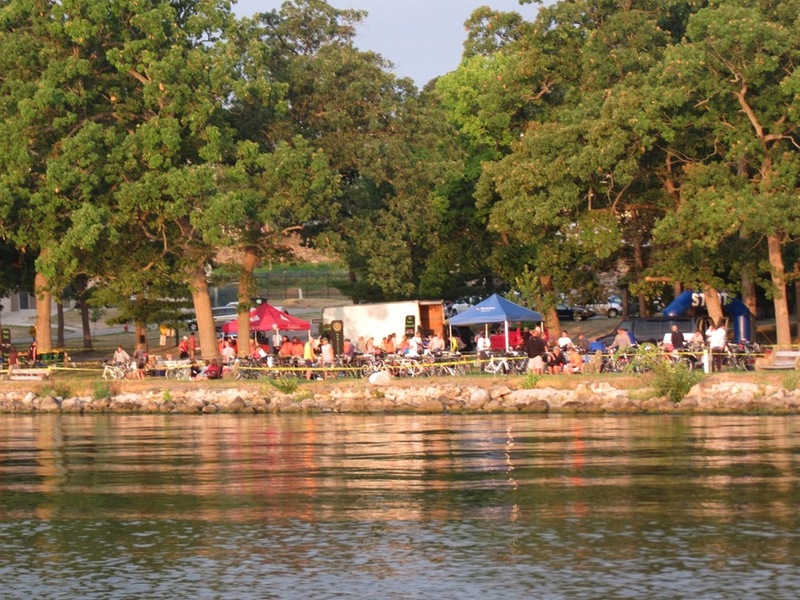 This upcoming triathlon will be really fun when the BOY and I host our families for a Father’s Day BBQ after the race. Have you ever done a triathlon? This breakfast came together accidently. Although I wish I could take full credit for being innovative and creative, I really just had some leftover quinoa that I didn’t want to waste and a few overripe bananas from my mom. And a need to make a breakfast that could travel with me over the weekend. The quinoa adds a hint of nuttiness, which is PERFECT for a pre-race brekkie! And a PR! I ate my first slice warm straight out of the oven because I had to run off to spin, and then packed two to go for my weekend race in the city. The last slice I froze for later in he week. It will be great to eat on the way to the gym. I signed up for my FIRST triathlon of the year! 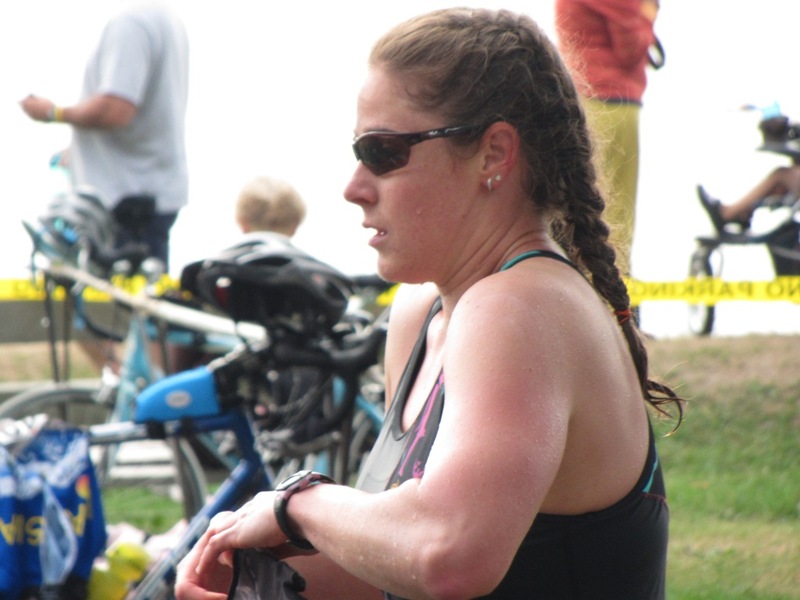 I will be doing the Iron Girl Sprint Triathlon on June 16th! Can you tell I’m excited? I probably could have stayed in bed yesterday morning! After an active weekend in the city, including a fast 8k race, my bed was a happy place for me to stay (possibly all day). But with a half marathon in just a few weeks, a spring triathlon, and the promise of a hot tub, I left my comfy bed despite the gray skies and pouring rain. Although I had intended on a bike/swim medley, I ended up only going to the pool for 25 minutes of swimming and 10 minutes in the glorious hot tub, nestled in next to the jets. It was glorious! Stir together uncooked oats, cooked quinoa, baking powder, cinnamon, and flax. Set aside. Mash bananas until smooth. Beat in egg, almond milk, vanilla and beat well. Stir in dry ingredients until just blended. Pour into prepared pan and bake for 30 minutes, until middle is set. Eat warm or freeze for later. 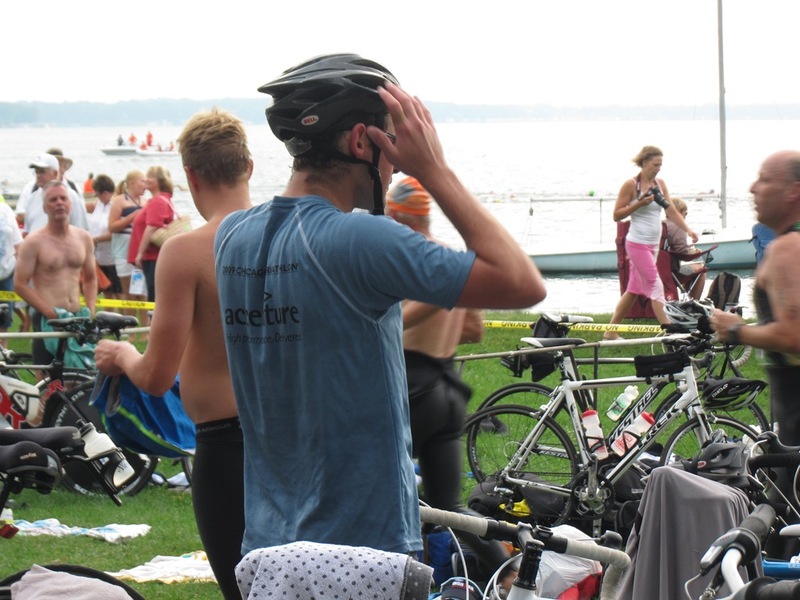 This year’s triathlon season began this weekend in Green Lake, Wisconsin. Since it was my only tri of the summer, I was really looking forward to the weekend! Sadly, I had a cold leading up to the race but was so happy to wake up Sunday with an unstuffed nose and a clear head. We had a fantastic day on Saturday playing on the lake before Sunday’s early morning rise. The sun was just creeping up over the trees and the lake looked calm and peaceful. Note to self…don’t ever forget to bring oatmeal for out of town races or you’re breakfast will be this hodgepodge of brown rice, almond milk, banana, and blueberries. Luckily, it tasted a little better than it looked! We headed down to the pier to load our bikes onto the boat. 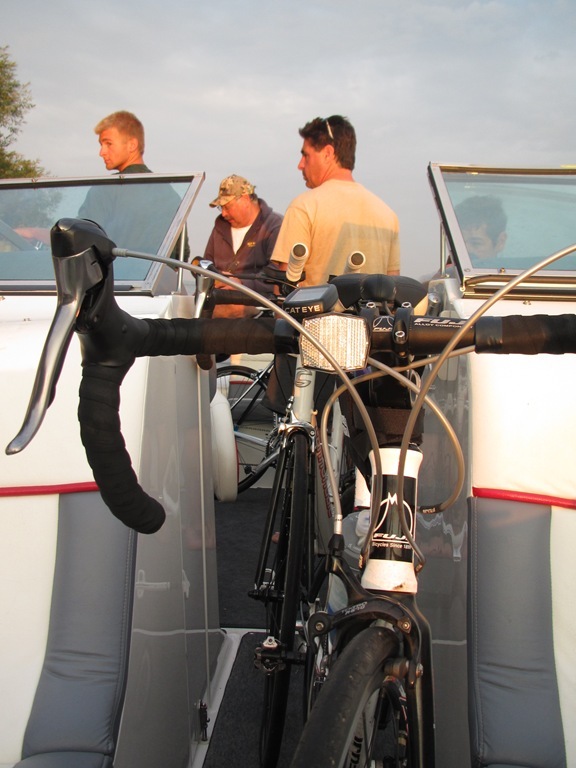 I thought it was neat to drive to packet pickup in a boat, but arriving at a triathlon by boat…EVEN COOLER!!! I loved the wind in my hair as we bounced across the lake heading towards the race site. Look who was leading the way and even more excited to arrive! We unloaded our bikes at the pier and made our way to the transition site. The Ripon Medical Center triathlon is a small (around 200 people) community race. The transition area was easy to access and the other races were warm and friendly. The best part about the morning was watching the sun rise over the lake! Just before the boys entered the water, my parents and the BOY got dropped off to watch the race and cheer us on. I was feeling a little nervous before entering the water. 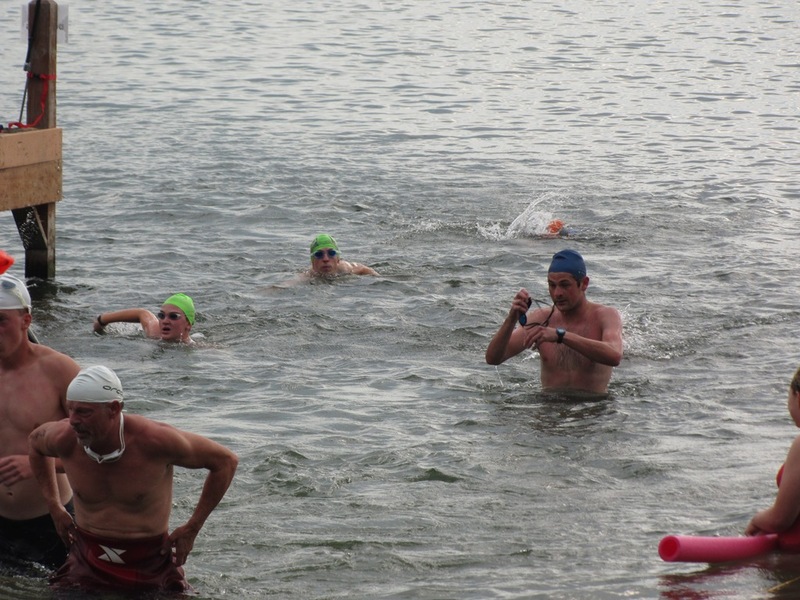 The boys went in about 10 minutes before me making the swim look easy (because for them…it is!). While I was out in the water, the boys came out of the water and went into transition. My Dad got some awesome action shots along the way! What felt like hours later (although it was closer to 16 minutes), I finally excited the water and strolled my way into transition. My thoughts on my swim…the first 5 minutes went wonderfully. I was calm, my stroke was strong-ish, and I channeled my inner Olympian. Then I hit the first buoy, slowed down a bit, rounded the second buoy, and my goggles fogged up completely and I had no idea where I was going. I was able to make my way back to the beach, but my goggles were already starting to leak. I finished the last few feet breast stroking with my goggles on my forehead before dragging myself out of the water. My swim was slow, but steady and I was thrilled that I stayed calm and actually had some fun this time. I took my time in transition feeling excited to have the bike and run ahead of me. It was a gorgeous day to be out for a bike ride! Before heading out for a hilly 5K run. Didn’t my dad get some incredible photos?! When I made it back to transition, there was only one portion of the race left and it was my favorite! I hit the run at full speed and then realized that I was headed back up another huge 1 mile hill. Yikes! The 5K was non-stop up and down, and I was happy that I had been training in the hills this summer! I saw my brother right before the half way turn around point, and my parents were waiting for him at the finish. A few minutes later, it was my turn to sprint to the finish. With the help of the hill, I had whole lot of momentum (and some adrenaline) to carry me across the finish line with the Fam cheering me on the whole way! Post race…we were all smiles!!! And, planning to return next summer to compete in the Green Lake Triathlon again!!! I hope to see some of you there! We boarded our boat to head back home for some food and a victory beer! A few days post race, I am feeling incredible! My shoulders are a little sore (will someone please refer me back to this post next summer when it comes time for training in the pool?! ), but I was back on my bike this morning for a leisurely ride, and I am looking forward to my family visiting this weekend. Saturday, it is back to Wisconsin for the Rugged Maniac Mud Run!